Michonne quickly discovers that Carl's real objective is not acquiring a crib for Judith…but rather, a photo of his mother. After learning from Morgan's writings, that the Grimes' home was destroyed by fire, Carl remembers that a local cafe had a framed photo of their family. 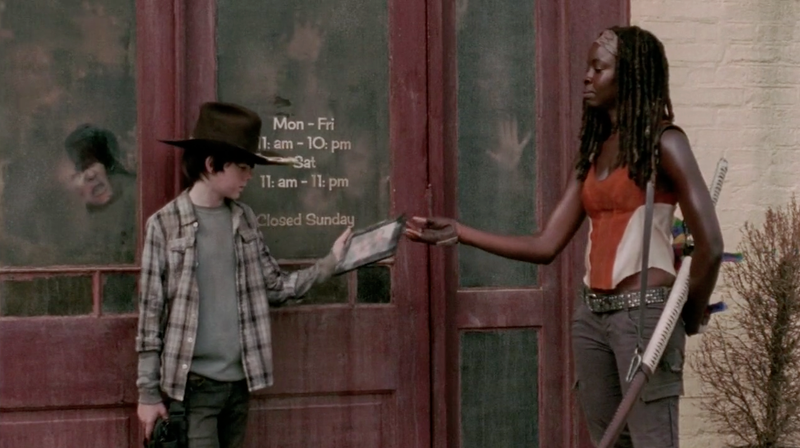 Michonne refuses to allow him to go into the cafe alone and after some effort, they leave with the photo. Carl is thrilled; he wanted Judith to know what their mother looked like. 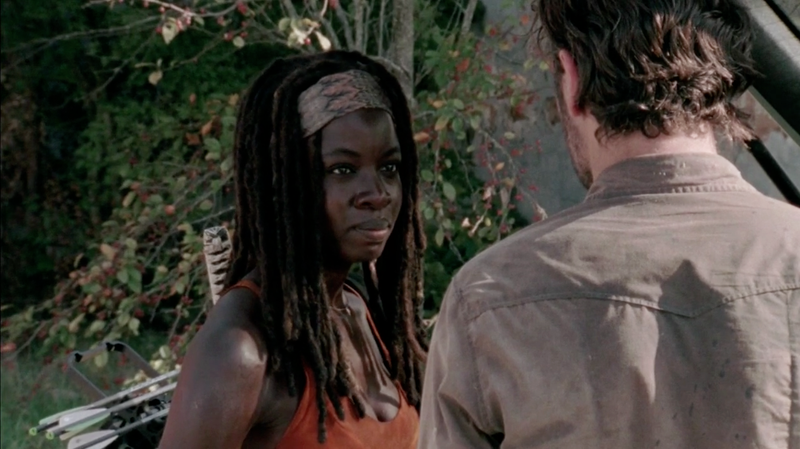 He thanks Michonne with a smile and they return to Morgan and Rick with their prize. 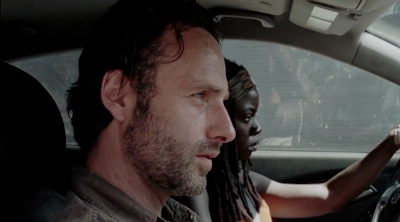 After packing up the weapons they need, Michonne confides to Rick that she knows that he sees things; and that she too, still talks to her deceased boyfriend. Surprised by her honesty, Rick hands Michonne the car keys and asks her to drive because he "sees things." On the drive back, the mood would have lightened considerably. 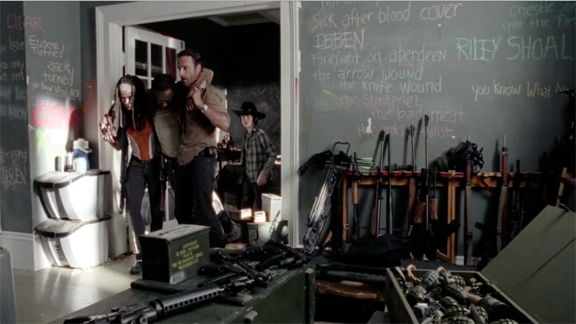 The Group now had the weapons and ammunition they needed to defend the prison. 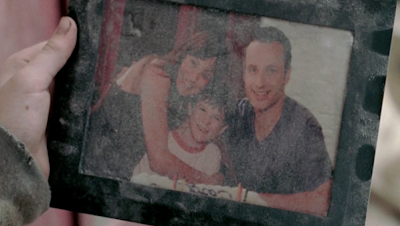 Carl would have unwrapped the sweets that Beth and Hershel packed for them to share on the drive. 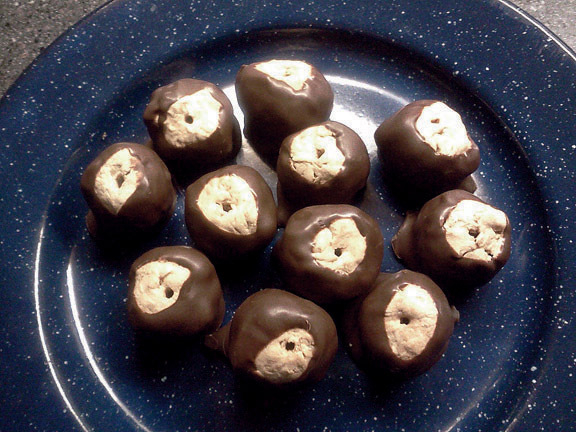 Crispy Buckeyes are a twist on Ohio's traditional Buckeye candies. 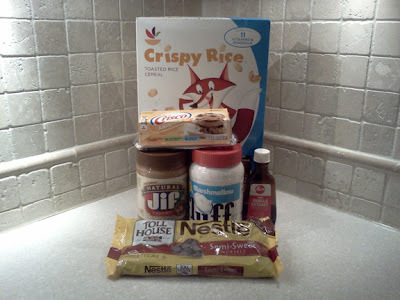 Made with only six pantry ingredients, these treats make use of crisp rice cereal to create their distinctive texture. And when the dead rise; don't leave ANYbody behind. Especially if they're running after you carrying an orange backpack and begging not to be left behind. For the Chocolate Coating: Over medium heat, (or over medium campfire coals), combine shortening and chocolate chips in a heavy saucepan or Dutch oven. Warm gently and stir frequently until chocolate is melted and mixture is smooth. 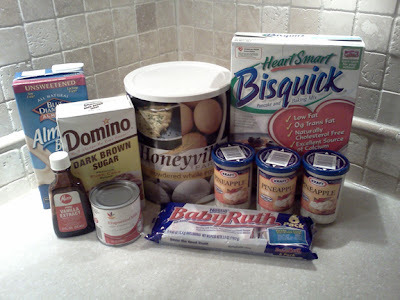 Remove from heat and set aside while preparing the candies. For Candy Mixture: Over medium heat, (or medium campfire coals) combine peanut butter, marshmallow fluff and vanilla in a heavy saucepan or Dutch oven. Warm gently and stir until peanut butter and marshmallow fluff are melted and smooth. Remove from heat and stir in cereal. Mix until combined and allow to cool to room temperature. 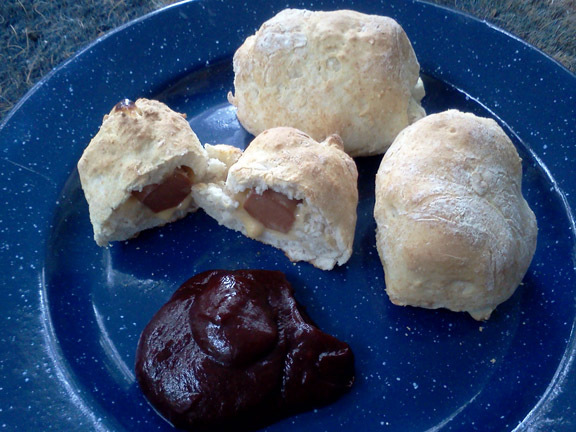 Roll peanut butter mixture into balls (about the size of a small walnut). Using a toothpick, dip each peanut butter ball into the melted chocolate mixture. Place each candy onto a greased baking sheet or waxed paper. Allow chocolate to harden and then wrap candies in an airtight container. 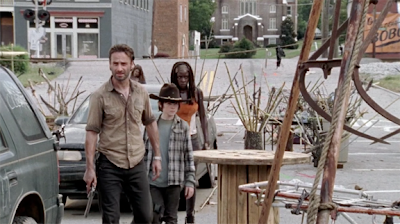 Rick, Michonne and Carl leave on a run for weapons. 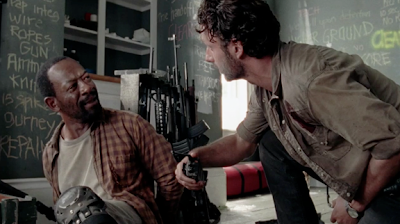 When they arrive at the King County Sheriff's Station, Rick is disappointed to see that the weapons locker has been picked clean. So he makes the decision to check out a few local businesses that had permits to carry weapons on the hope they will still be there. As they approach Main Street, they see it is filled with elaborate booby traps. Rick leads Michonne and Carl carefully around the traps but as they approach the center of town, shots ring out and a threatening, helmeted figure from the rooftop screams at them to drop their weapons and leave. 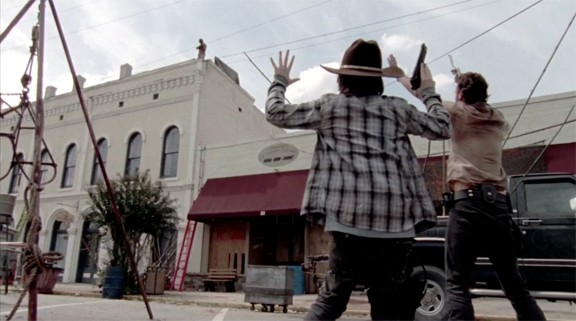 Carl is able to get in a lucky shot and take the gunman down without killing him. After removing the helmet, Rick is stunned to see the face of Morgan Jones. They take the unconscious man inside and see his top floor hideout. He has stockpiled weapons and created a private armory for himself. 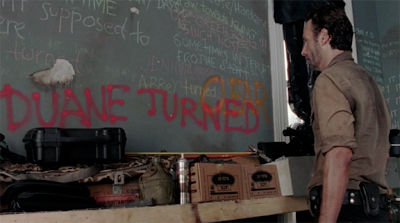 They are especially disturbed to see that Morgan has scrawled bizarre writings all over the walls, detailing his ordeal since the government fell. Rick also finds the walkie-talkie that he gave to Morgan at their first meeting. His friend has seemingly gone insane and Rick finally sees "DUANE TURNED" painted in red on the wall. 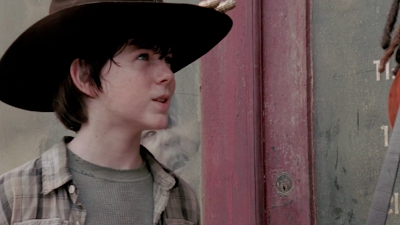 Carl insists on leaving to find a crib for Judith. With Michonne to accompany him, Rick is left alone with Morgan. 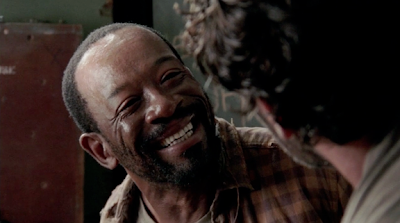 Upon awakening, Morgan is frantic and believes that he is hallucinating. 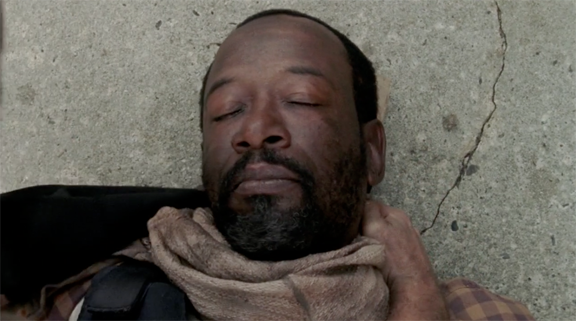 Rick finally convinces him that he is real and Morgan then becomes hysterical and stabs Rick. He then begs to be put to death. 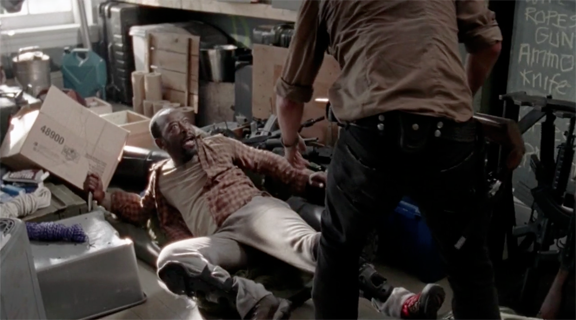 Rick does his best to comfort Morgan. While he tries to convince him to return to the prison with them; he would have insisted that the man have something to eat. 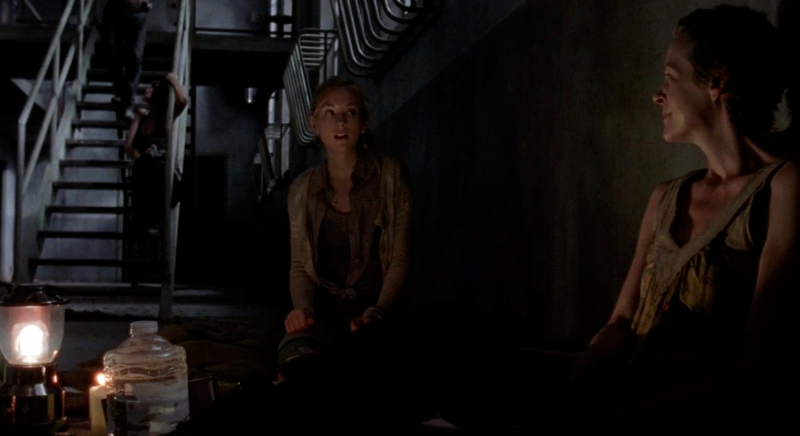 Hershel and Beth would have packed something portable and delicious and Rick would certainly have been willing to share. With a cheesy filling wrapped around mini sausages and enclosed in a biscuit-like crust, Cheese Pups are easy to fix and perfect to take with you. Accompanied by Red Eye Ketchup, these Chess Pups will especially please children. And when the dead rise: don't believe it if the sign says "Welcome." This recipe can be easily doubled or tripled for larger groups. Preheat oven to 450°F. Alternately, heat campfire or grill coals until red hot. In a small bowl, combine baking mix and water. Stir well until a soft dough forms. Sprinkle additional baking mix onto a clean, flat work surface. Knead dough 10-12 times or until smooth. Divide dough into 12 portions. Roll or pat each dough portion into a six by four inch rectangle. Wrap one slice of cheese around each sausage and place on the dough. Roll up each dough rectangle around the sausage and cheese. Seal the edges of the dough around the ends of the sausage to seal. Place pup in a baking pan. 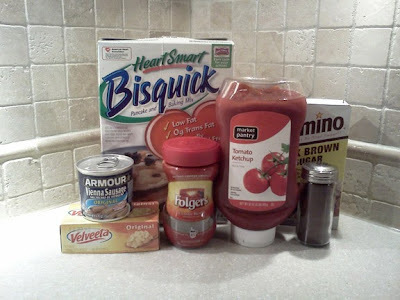 Repeat the process with the other portions of dough, cheese and sausage. Bake in preheated oven for 12-14 minute or until dough appears golden and sounds hollow when tapped lightly. Alternately, place pups in a cast iron skillet. Cover tightly with foil and place over hot coals. Allow to "bake" for 5 minutes and rotate. Allow to "bake" for 5 additional minutes and check once more. Pups will be finished baking when they are golden and sound hollow when tapped lightly. Serve with Red Eye Ketchup. Combine all ingredients in a small pan and warm gently. Stir until the coffee granules are dissolved. Pour into a small covered container and allow to cool to room temperature. Serve with the Cheese Pups. 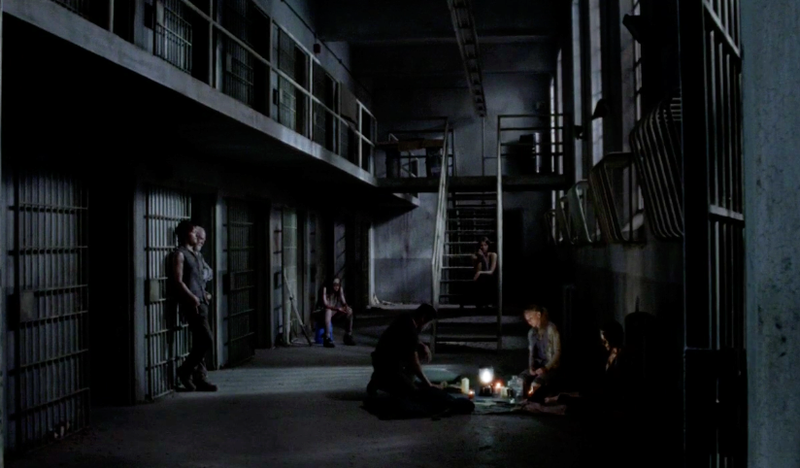 The Group sits together in the darkness that evening after Andrea's departure. Rick holds baby Judith as Beth sings softly to them all. 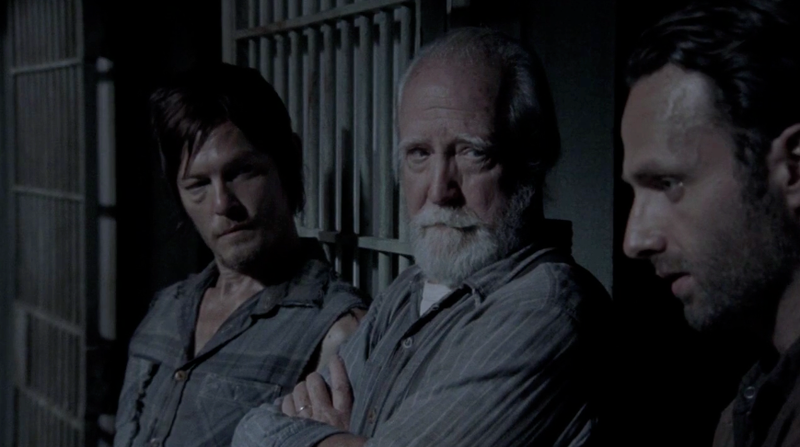 Hershel believes that Andrea is persuasive and may still be able to reason with the Governor. 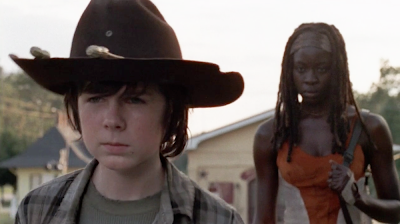 Rick does not share his faith and wants to take Michonne and Carl on a run for weapons; with Daryl in command of the prison. 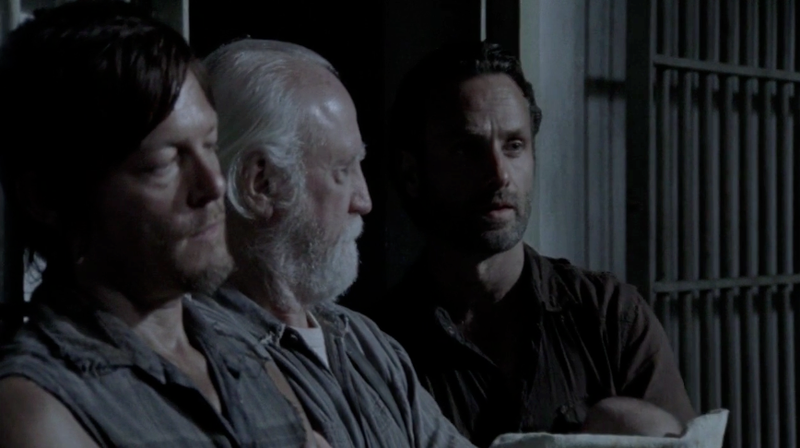 Rick assures Daryl that he is glad for his return; but any trouble with Merle will be Daryl's fault. Daryl does not seem to object and agrees to the plan. 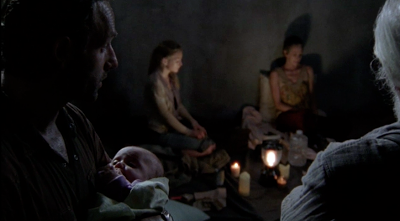 Although their future continues to look uncertain, the Group still has each other. 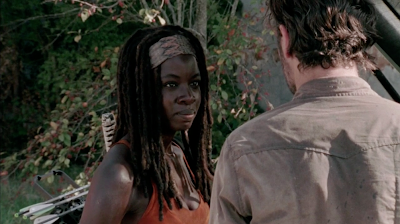 Seeing Andrea again has served to remind them just how far they have come. Hershel would most certainly have handed out a sweet treat for them to share. 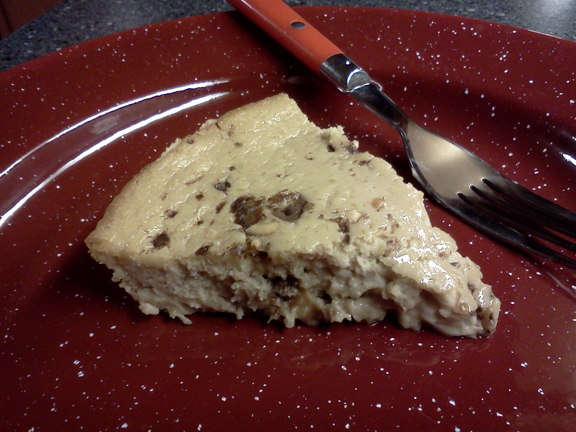 A few basic staple ingredients (along with scavenged candy bars from the break-room vending machine or office snack drawers) can be combined into an almost authentic cheesecake. Try this recipe and remind your group that better days will come. 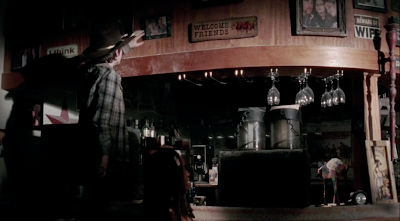 And when the dead rise; a little Tom Waits might make you feel better. Preheat oven to 325°F. Alternately, heat campfire coals until red hot. Allow to burn until covered with white ash. Grease or spray a 9-inch baking pan or 9-inch pie pan with cooking spray. In a large bowl, combine cream cheese spread and the next five ingredients. Mix very well until the mixture is combined. It will not be entirely smooth because of the pineapple cream cheese spread. Pour mixture into the prepared baking or pie pan. Sprinkle with candy bar chunks and stir in very gently. Bake in preheated oven for 35 to 40 minutes. Only the edges of the pie should be set; the center will still quiver when you gently move the pan. Alternately, wrap baking pan tightly with aluminum foil or rest a baking sheet on top and place the pan over coals. Allow to "bake" over campfire for 20 minutes. Remove from fire and test for doneness. Recover and return to campfire for an additional ten minutes if needed. Allow to cool to room temperature and cut into slices to serve.